We respond to pollution that poses threats to marine resources and coastal habitats. We collect scientific data to determine if natural resources have been injured and then assess the injury. We determine how the public’s use of beaches, fishing areas, and other recreational activities is disrupted after a pollution event or ship grounding. We work collaboratively with our federal, state, and tribal partners to hold responsible parties accountable for injuries to natural resources. Through settlement or litigation, we seek to recover the funds needed to restore injured resources and compensate the public. We develop restoration plans that address natural resource injuries and losses, with input from the public. We use funds recovered from the responsible parties to restore the resources and habitats that were harmed. We also undertake projects—such as constructing or improving boat ramps, fishing piers, and beach trails—to compensate for lost recreational uses. Learn how we use the Natural Resource Damages Assessment process to restore impacts from pollution along our nation’s coasts and Great Lakes. 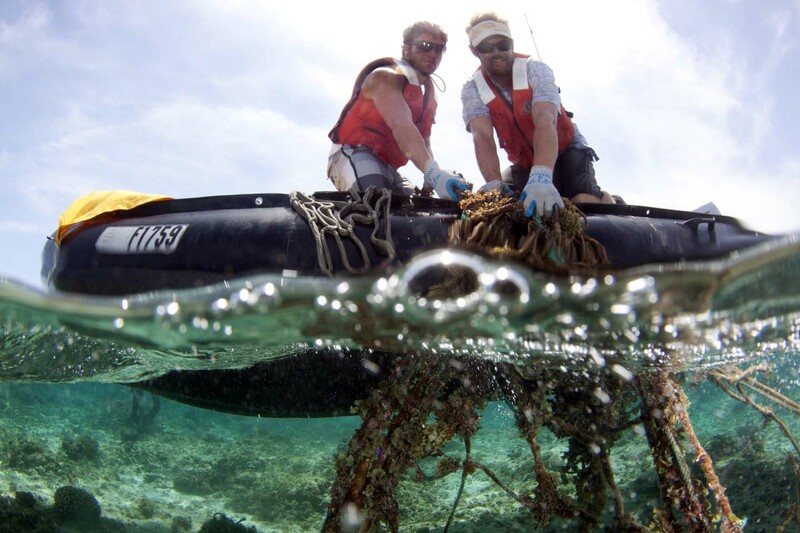 Two members of the NOAA dive team remove derelict fishing gear from Midway Atoll. We conduct Natural Resource Damage Assessments to assess and restore natural resources after oil spills, ship groundings, and hazardous releases. Learn about this process—what triggers it, who performs it, and what the outcomes are.